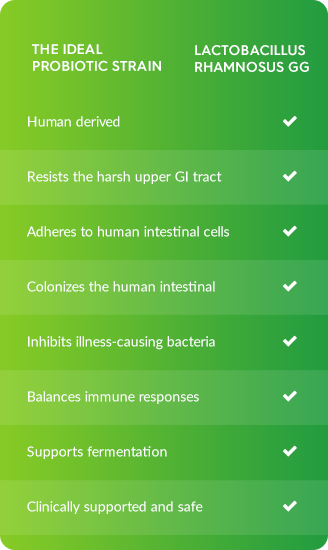 Different strains do different things and one must be careful to select the appropriate strain for the intended purpose.1-4 Lactobacillus GG is the most extensively studied probiotic strain5 and helps restore the balance of the microbiota to support better digestive and immune health. Probiotics like LGG® are live microorganisms, which when administered in adequate amounts, confers a health benefit on the host6. LGG® promotes the balance of the intestinal microbiota to provide digestive assistance and immune support6. The micobiota is a delicate ecosystem. Many external factors can disturb the balance, leading to pathogenic invasion, inflammatory responses, and ultimately, disease. For example, antibiotics can kill beneficial bacteria, making hosts vulnerable to pathogenic bacteria, such clostridium. Thomas CM, Versalovic J. Probiotics-host communication: Modulation of signaling pathways in the intestine. Gut Microbes. 2010;1(3):148-163. Guarner F, Malagelada JR. Gut flora in health and disease. Lancet. 2003;361(9356):512-519. Saad N, Delattre C, Urdaci M, Schmitter JM, Bressollier P. An overview of the last advances in probiotic and prebiotic field. LWT -Food Science and Technology. 2013;50(1):1-16. European Patent Office. https://worldwide.espacenet.com/publicationDetails/biblio?CC=US&NR=4839281&KC=&FT=E&locale=en_EP. Accessed August 27, 2017. Szajewska H, Guarino, A, Hojsak I, et al: Use of Probiotics for Management of Acute Gastroenteritis. Journal of Pediatric Gastroenterology and Nutrition. 2014;58(4):531-539. Hojsak I, Szajewska H, Canani R et al: Probiotics for the Prevention of Nosocomial Diarrhea in Children. Journal of Pediatric Gastroenterology and Nutrition. [doi: 10.1097/MPG.0000000000001637][Epub ahead of print]. Cruchet S, Furnes R, Maruy A, et al: The Use of Probiotics in Pediatric Gastroenterology: A Review of the Literature and Recommendations by Latin-American Experts. Paediatr Drugs. 2015; 17(3): 199–216. Hojsak I, Snovak N, Abdovic S, Szajewska H, MiÅ¡ak Z, Kolacˇ ek S. Lactobacillus GG in the prevention of gastrointestinal and respiratory tract infections in children who attend day care centers: A randomized, double-blind, placebo-controlled trial. Clinical Nutrition. 2010;29(3):312-316. Horvath A1, Dziechciarz P, Szajewska H. Meta-analysis: Lactobacillus rhamnosus GG for abdominal pain-related functional gastrointestinal disorders in childhood. Aliment Pharmacol Ther. 2011; 33(12):1302-10. Szajewska, H. & Kolodziej, M. Aliment. Systematic review with meta-analysis: Lactobacillus rhamnosus GG in the prevention of antibiotic-associated diarrhea in children and adults. Pharmacol Ther. 2015 42(10)1149-57. Gogineni VK, Morrow LE, Malesker MA. 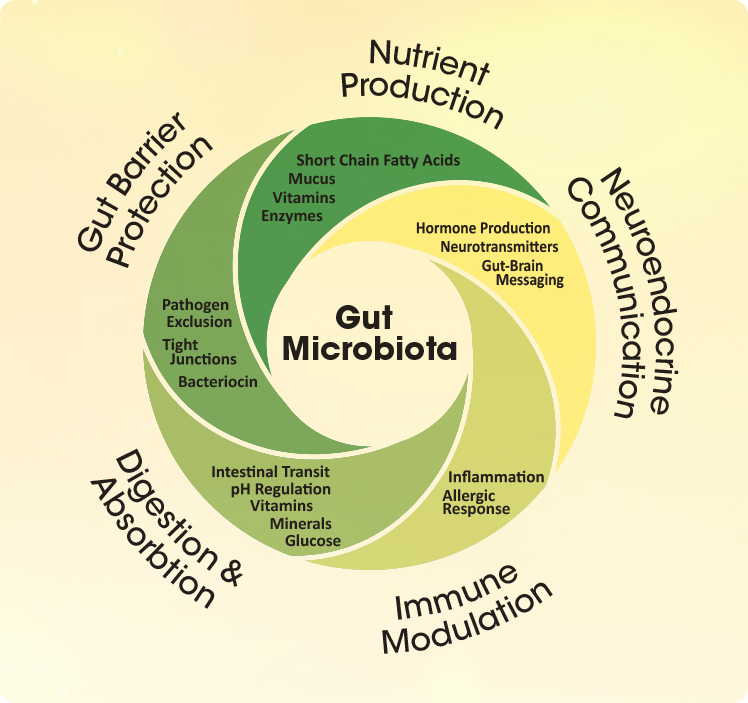 Probiotics: mechanisms of action and clinical applications. J Prob Health. 2013;1 (1):1-11. Jandhyala SM, Talukdar R, Subramanyam C, et al. Role of the normal gut microbiota. World J Gastroenterol. 2015; 21(29):8787-8803. Quigley EM. Gut bacteria in health and disease. Gastroenterol Hepatol. 2013;9(9):560-569. Carabottia M, Sciroccoa A, Masellib MA, Severia C The gut-brain axis: interactions between enteric microbiota, central and enteric nervous systems. Annals of Gastroenterology. 2015;28:203-209. Belkaid Y. Hand T. Role of the Microbiota in Immunity and inflammation. Cell. 2014;157(1):121–141.